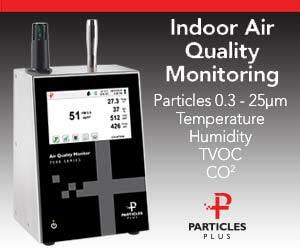 Those of you who know me know that, for years now, I have had issues with the ongoing proliferation of certificates and certifications in the indoor air quality (IAQ) and mold profession. By last count, the American Council for Accredited Certification (ACAC) has 12 different contractor and investigator certifications related to IAQ, and another 8 certifications related to mold and moisture control. In addition to ACAC, there are a multitude of other groups and organizations who also issue their own somewhat dubious certifications related to IAQ and mold. You say you want to be a “Certified Formaldehyde Sampler” and do testing in homes with laminate flooring? No problem, just step right up, pay us a bunch of money, take one of our training classes, and, wham, now you are certified! With the enactment of the New York State mold regulations, for example, I think it’s safe to say we will be seeing a whole new generation of 2-, 3- and 4-day wonders who will be able to point to their state issued licenses and proclaim that they are mold “experts”. In New York, the new mold assessor designation is responsible for determining the clearance criteria of mold remediation projects. It is a certainty that, not knowing any better, many of these newly minted “experts” will choose to collect spore trap samples and assign some sort of arbitrary criteria without ever understanding the shortcomings and pitfalls of this methodology. Standard spore trap sampling devices function by pulling air through a sample slit, which accelerates the particles in the air stream, and then fling those particles at a small glass slide that is covered with a sticky sampling media (think flypaper or a glue trap). The device works on the principal of inertial impaction, which I described in some detail in my June 2015 article for Healthy Indoors (‘Ghosting and things that go Bump’). Short version – when air sharply turns and bends, particles in the air stream tend to keep moving in a straight line and bump into stuff. The bigger the particles, the more likely they will hit the surface and stick. The smaller the particles, the more likely they will bend with the air and pass right by. 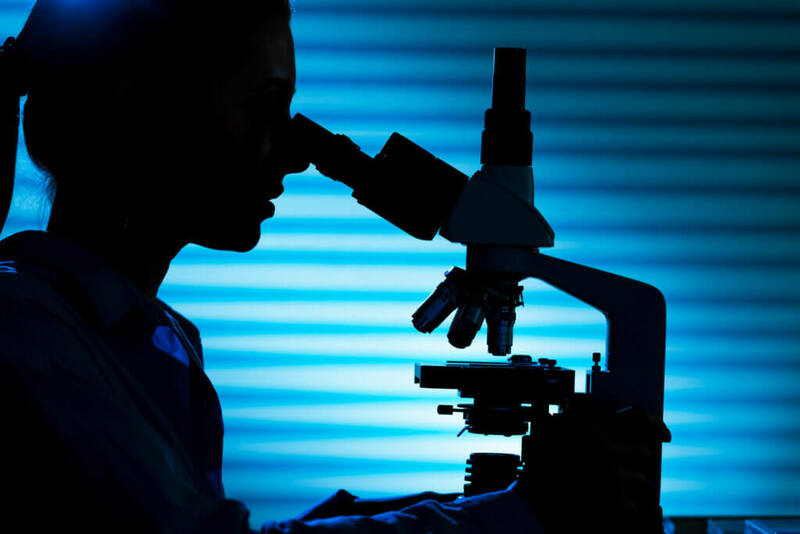 Each manufacturer has their own optimal flow rate for their samplers and cassettes, which is designed to try to ensure that as many small particles as possible will be captured. If the flow rate is too slow, then the smaller particles, such as mold spores, will pass by and not get collected. Not really an ideal situation when you are trying to sample for mold spores. If the flow rate is too fast, then larger particles will strike the surface of the collection media too hard and bounce off. The face velocity of a sampling cassette is essentially how fast the air is moving, at the face of the cassette, as it gets pulled in by the pump. In industrial hygiene, knowing the face velocity of the sampler is critical when doing isokinetic sampling in an airstream because of the inertial impaction thing. The face velocity of the standard Air-O-Cell spore trap cassette, when run at the recommended flow rate of 15 liters per minute, is slightly less than three-and-a-half miles per hour. What this means is, right at the face of the cassette the air being pulled into the cassette is moving at three and a half miles per hour. As you move away from the face of the cassette, the air velocity drops off precipitously, so much so that the velocity a mere two inches away from the cassette face is virtually non-existent. So why does this matter? Well, if you are sampling in a nice quiet room where there are no real air flows or currents, then we don’t have any real issues. However, if you are collecting an outdoor air sample, and there is a wind blowing across the face of the cassette at a faster speed than a light breeze, then many of those small particles get blown right by and are never captured. The faster the wind speed, the more particles within that air stream that the device will fail to capture. So much for trying to compare the results from your outdoor samples to the indoor samples. 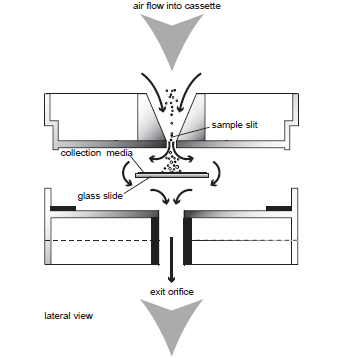 The 50% cut-size (D50) of a standard Air-O-Cell cassette, at room temperature and when run at the recommended flow rate, is about 2.6 microns (um). What this means is that half of the particles with an aerodynamic diameter of 2.6um will impact the collection media in the sampler, and half of them will pass right by. Mind you, I said that half the particles will impact the collection media. This does not mean, however, that all of them will actually stick and stay there. The more particles that are already stuck on the media, the more likely that other particles will hit them and bounce off. In addition, the cut-size curve for spore trap samplers tends to be extremely steep. For instance, the D50 for the Via-Cell sampler is 1.56 um. However, when you get down to an aerodynamic diameter of about 1.51 um the collection efficiency drops down to about 26%, and at an aerodynamic diameter of 1.4 um it is only around 7%. So, you may ask, why is this important? Well the aerodynamic diameter for Penicillium and Aspergillus spores is generally in the 1 to 3 um range, so if you are sampling in an environment which has been contaminated by these types of mold then chances are you’re likely missing more than half of the spores that are actually present when you collect your sample.